I actually noticed this on my 17" FZ09. It was never done intentionally but I noticed a few times, when my foot would accidentally nudge the shifter it would pop up a gear. And it would happen smoothly as though it was designed like that. Always made me worried/scratch my head if I broke anything. Great to know. So does this mean that it acts as a quick shifter (minus 1-N-2)? Eh, I prefer to pull in the clutch just past the disconnect point and then shift and let it go. On a light clutch like the the FZ engine its pretty easy to do. I hardly use the clutch for up and down. For sure, 1st to 2nd then the rest no clutch... too wide a throw. The foot has to be under the lever but no load. The chain has to be loose but too loose and the shift won't be clean. Too many miss-shifts the chain is too loose. Blip for downshifts. The main word here is 'timing.' No timing, you clan the gears and once you hear it bang gears, pull the clutch in and let it drop into gear, don't chase it, don't rev it. This is an old style formula 1 gearbox that hasn't changed since inception. Seamless has an updated 'syncro-mesh' kind of helper gear. I blip the throttle on downshifts without the clutch most of the time, if timing is right it is much smoother than using the clutch. Usually partial clutch pull on upshifts. I miss the old 2smoke dirtbike days of just holding her WFO and pulling up on the shifter...Woohoo! If you go to the link it will show the entire picture with the text at the bottom. 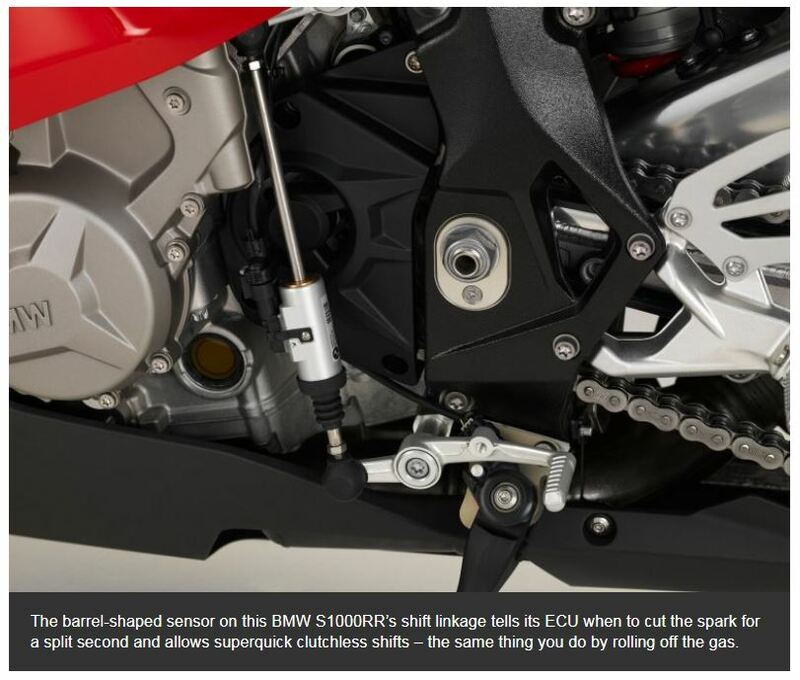 The barrel-shaped sensor on this BMW S1000RR’s shift linkage tells its ECU when to cut the spark for a split second and allows superquick clutchless shifts – the same thing you do by rolling off the gas. Sure a quick shift might be handy if you are racing, but even then it's better if it allows up and down shifting. For the street, once you get the hang of it, you can easily do clutchless shifts. So save your money and just learn how to shift properly. Plus I would hate to see what happens when the quick shift fails during hard acceleration and a wide open throttle....ouch! I also found the 3/4 clutch levers, instead of the full-size clever that come stock from the manufacturer, help tremendously in refining that fine point between a little clutch and full clutch. A cheap performance upgrade since you can adjust the point the clutch grabs to your hand size. It's easy to learn how to clutch-less shift, and here is a good video that explains how to do clutch-less up and down shifts. Last edited by Rocky_MTN_FZ09; 11-03-2017 at 12:09 PM. MoFZio and parkmeister like this. I've been out of the motorcycle world for about 18 years. What is a 3/4 clutch lever? I already hate the clutch lever and the location of the horn button on my new FZ09.